The latest Nissan Micra has just arrived in showrooms showing off new looks, new quality, and new technology. With a completely new exterior look, comprehensively improved interior and bursting with new technology, the new Micra marks the next chapter in the story of Nissan’s remarkable small car. And there have been over 100,000 examples sold since the original appeared more than 30 years ago. Nissan Micra has long been one of the company's best-selling models in Ireland. Pricing starting from €14,995 will remain extremely competitive in the lower part of the B-segment and unrivalled specification in the standard grade will mean Micra will be one of the best value choices in the segment now too. The most obvious changes to new Micra can be found on the exterior of the car with visual changes including a new grille. This re-establishes a stronger link to Nissan’s corporate look - as seen on other Nissan models, the familiar circular badge is ‘held’ within a chromed extended V-shaped motif. The changes go far beyond a facelift, however. In total, more than 50 per cent of the body panels have changed. As well as a new bonnet, there are new wings, headlamps and front bumper while the front fog lamps, where fitted, have been given a distinctive new shape and chrome surround. At the rear, there’s a new bumper, LED tail lamps, and infill panel at the bottom of the tailgate. New colours and new alloy wheels complete the exterior changes, which combine to give New Micra a stronger, more assertive and dynamic look. Inside, the trim and finishing touches have been enhanced with a higher quality look and feel. New features include gloss black on the centre console and new square vents while the gear selector, door arm rests and dials now have a silver painted finish. The door armrests have been textured to give a higher quality appearance and there are new seat and door pad fabrics. The standard Micra has a durable tricot/tricot mesh woven fabric while the SVE grade has a suede-like fabric with double stitching. Without doubt this latest Micra is the most innovative yet, with advanced connectivity with the latest Nissan Connect 2 navigation and communication system on the higher spec of the two model line-up. Built around a larger (5.8-inch ) touch screen, the upgraded navigation software features eco-routing, which automatically calculates the route likely to use the least fuel. This is supplemented by an eco-scoring table, which allows a driver to check how economically he or she has been driving. The navigation system includes a motorway ‘exit view’ complete with lane guidance to help when leaving motorways and the system also displays prevailing speed limits with a driver-set speed warning providing visual and audible alerts when the car hits a certain speed above the limit. And the larger colour screen not only means maps and directions are easier to read, but also album cover art linked to the owner’s music library can be displayed. Nissan New Micra’s city smart credentials include electric power steering, a tight turning circle - at 4.65m, one of the best in its class - and the availability of parking slot measurement, which calculates whether a potential parking space is big enough for the car and alerts the driver via a dashboard read-out. It can even be fine tuned to account for the driver's skill: amateur, normal or expert. 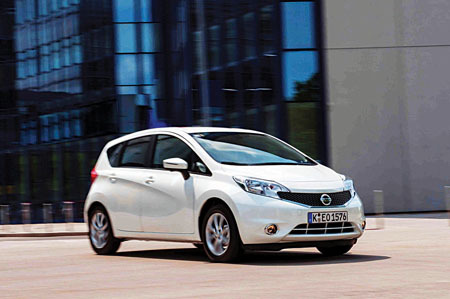 The Nissan Micra is available in two grades – Micra and SVE. The SVE grade costs €15,995 and is equipped with automatic air conditioning, NissanConnect, rear parking sensors, parking slot measurement, 15-inch alloy wheels (16-inch alloys are an option ), and suede-like seat fabric. I-Key, automatic headlamps and wipers, and folding door mirrors are all options on the SVE grade. Power comes from an advanced three-cylinder direct injection petrol engine. The 1.2-litre engine produces 80PS for lively performance and CO2 emissions from 115 g/km.